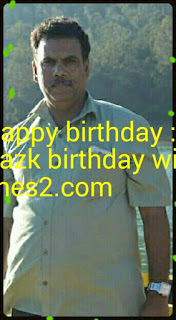 Happy birthday Dear Razak Musliyarakath - birthdaywishes2- Birthday wishes sms,birthday wishes images,,special birthday. at Government High School Malangadi Kondotty. After joined Government Vocational Higher Secondary School Kondotty. His home at kondotty. Now living in Dammam Saudi Arabia. family relatives.15th June 1975 is his Birthday.